Announcements: 1) slight syllabus change for Tuesday 11/1 (see below). 2) I’ll be away at the African Heritage Studies Association conference on Thursday 11/3, so class won’t meet. Not to worry — use the time to read ahead in Angie Cruz’s Soledad, which is next on the syllabus. For Tuesday November 1:, we’re going to do a slight syllabus change and finish discussing Do the Right Thing instead of reading Alice Childress’s Wine in the Wilderness as originally planned. To prepare, (re? )read the excerpt from from Murray Forman’s The ‘Hood Comes First: Race, Space, and Place in Rap and Hip Hop on reading urban space, which is a PDF on the Readings page and this article from New York magazine on the intersection of race and Brooklyn gentrification. Also see my lecture notes on the film. You can re-watch the entire film from the Video page (same password as everything else). Watch this short summary of Spike Lee’s “rant” about gentrification that caused a lot of controversy and discussion in 2014. Thursday November 3:, I’m away at a conference and class doesn’t meet. Read ahead in Soledad and catch up on anything you haven’t done re: DTRT. For Tuesday October 25:, we take a detour into representations of the city in film. 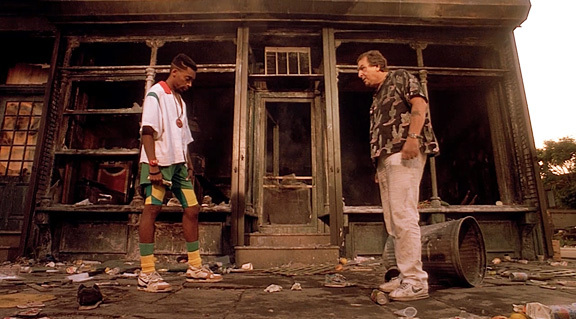 Spike Lee’s Do The Right Thing won by one vote, so that’s what we’ll watch. We’ll spend the entire class on the first half of the film. DTRT is now a classic film, but was extremely controversial at the time. commenting on race relations, gentrification, and much more. We’ll focus on the aspects of race relations, police brutality, gentrification, and urban space as seen in the film. For Thursday October 25:, we finish watching Spike Lee’s Do The Right Thing. Week of 10/18: Baraka’s Dutchman and film vote! For Tuesday October 18th:, we take a sharp turn and read the classic play Dutchman from Amiri Baraka (then named LeRoi Jones). Read only the first half of the book: the play Dutchman. (We’re not reading the second half of the book, a separate play The Slave.) Even though it’s short, you need to read it slowly and carefully. Presentation by: Jae, Denise, Gabriel, and Cheyenne. For Thursday October 20:, we continue our discussion of Dutchman. Re-read Clay’s final speech at the end of the play and other key sections. Think about the discussion questions and what makes it an urban play. Also think about how you might stage it as a play. How might characters act How would you imagine them? We’ll watch clips of performances and compare them. Read Baraka’s short essay “The Revolutionary Theatre” (download the PDF here) and relate it to Dutchman. Does the play do what he proposes here? The following week, we take a detour into representations of the city in film. Now for the fun part: I’m kicking the decision to you to vote for the one you want to see. What I’m looking for is something that shows NYC neighborhoods (or at least a neighborhood) with several outdoor shots, intersects with at least some of the themes we’ve seen, is in the time period we’re looking at but old enough to show a NYC that’s probably unfamiliar, and, honestly, I have or can get my hands on easily. It’s a quasi-scientific process with a heavy does of gut instinct. So here are the options: Spike Lee’s Do The Right Thing and Walter Hill’s The Warriors. Lee’s now-classic film deals with issues of race, space, police violence, and neighborhood life in 1980s Brooklyn. The Walter Hill-directed The Warriors (1979) is almost pure camp: a fictional look at the (very real) gang life in early 1970s New York. The acting is over-the-top, plot is fairly simple, but there’s a lot of action and it’s a definitive New York film in many ways. Here are trailers for both films, courtesy of YouTube. After that, make your choice with the poll below! One vote each (current students only, please). The poll will close next Tuesday before class.